from Wikipedia (depth of field). According to the depth of field (DOF) fomula, the DOF is linearly proportional to the circle of confusion (C), in which C is also linearly proportional to the pixel size. Thus DOF is linearly proportional to the pixel size. 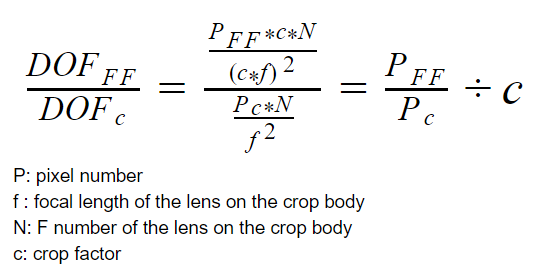 If that assumption is correct, then does that means some of the DSLR with APS-C sensor size and low pixel number would have a shallower DOF than some of the full frame DSLR with a high pixel number, assuming using full frame equivalent lens by considering the crop factor and same distance to the capturing subject? For example the Pentax K-100D has 6 Mega pixels with an aps-C sized sensor, comparing to Pentax K-1 with a full frame sensor and 36 Mega pixels. The DOF of K-1 would be about 4 times deeper than that of K-100D. Please correct me if I my logic is not sound. Thank you for your time and effort! the DOF is linearly proportional to the circle of confusion (C), in which C is also linearly proportional to the pixel size. No. The CoC criterion is the largest blur that will be perceived by the viewer as a point. At low resolutions, this may be limited by pixel size, but generally in real world use other factors are dominant ­— display size, distance of viewer, etc. Since this is one of your basic assumptions, and it is not correct... everything after that falls apart from there. Fancy technology cropped vs old technology full frame - Which will give better images? How to calculate the size of object in pixels, knowing the camera properties and distance? Does a larger sensor resolution increase the difficulty of shooting hand-held? When do the differences between APS-C and full frame sensors matter, and why?